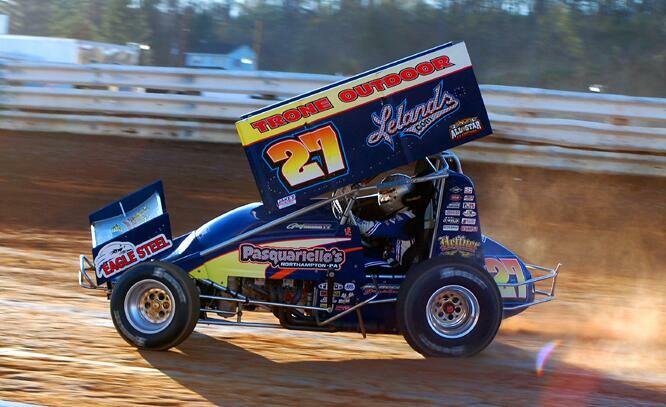 Port Royal, PA — (April 26, 2014) — Greg Hodnett of Thomasville pocketed a total of $13,400 for his victory in the All Star Circuit of Champions Sprints Bob Weikert Memorial at Port Royal Speedway on Saturday night in a race that saw the front four cars contend for the lead at one point during the mid stages. It was the fourth victory of Hodnett’s career in the prestigious event and his first of the season anywhere as well as for his new team owned by Mike Heffner. Just before the feature began, the Weikert family announced in conjunction with oval officials that the 2015 installment of the event will be expanded to a 40-lap feature that will pay a minimum of $15,000 to the winner. Some 36-cars competed in the 2014 event with Hodnett setting fast time over the field and garnering $500 for his efforts in honor of late fan Raymond Jacobs. Chad Layton then won the dash to earn the pole for the 29-lap Weikert main while also pocketing $300 for the dash victory. Hodnett started second in the feature via a second in the dash. But when Layton jumped the gun to start the Weikert feature, All Stars rules forced him back a row for the restart, which in turn moved All Star Dale Blaney to the pole for the new green. Blaney and Hodnett dueled when the feature began with Blaney leading the field through the first and second turns only to see Hodnett take control narrowly as the pair traversed through the fourth turn, leading back to the stripe in side by side fashion with Blaney. A yellow flag for Weikert No. 29 driver Danny Dietrich regrouped the field for the only time during the affair as the final 26 laps would go non-stop. Blaney shot underneath Hodnett for the lead on the restart but as would be the case numerous times over the next 20 laps or so Hodnett would slingshot off of the cushion in the second corner to drive back into control on the backchute. Seventh starter Brent Marks and sixth starter Shane Stewart began bolting to the front during the ensuing laps and by the time the leaders entered the backmarkers on the tenth tour they were in contention for the win. With the four lined up under a blanket within a half straightaway of one another, Blaney blasted underneath Hodnett in the first and second turns to take control on the 15th lap as the pair raced down the backstretch. But Hodnett changed him up as they headed into the third corner and reclaimed the top spot to again be in front at the line. Blaney continued his assault for the lead during the next three miles of racing before Hodnett began slowly sneaking out of sight in traffic. The pair of Marks and Stewart by then began exchanging the third spot with Stewart taking the position with 11 laps to go before blasting by Blaney for second with eight laps left. Both Blaney and Marks then surged back around Stewart during intense racing in traffic with four laps to go. Marks, then surging late motored by Blaney for second with a pair of laps left but Blaney fought back to cross the finish line in the end as runner up. Marks was third followed by Stewart and 10th starter Danny Holtgraver. Chad Layton rode home sixth followed by Lucas Wolfe, Mike Wagner, Ryan Smith and Logan Wagner. Hodnett’s total of $13,400 included the posted $10,000 for the victory, $2,900 in lap money at $100 per lap and the $500 for fast time. The winning driver, car owner and mechanic received certificates for personalized embroidered jackets from the National Sprint Car Hall of Fame. After starting 24th in the field, Aaron Ott earned the Hard Charger award of $300 for finishing 11th in the feature. Heats worth $150 to each winner courtesy of Packers Concessions and the Weikert family went to Logan Wagner, Tim Shaffer, Pat Cannon and Mike Wagner. Layton won the dash and Danny Dietrich took the B Main. Andrew Yoder wired the field for his second victory in a row in the 355 econo late model division. Yoder started second in the field and after a rough start to the 15-lap main that saw several caution flags unfurl early, he pulled away to a large margin for the win. Eric Irving rode home second followed by Ralph Morgan Jr., Tim Krape and Troy Miller. Twin heats went to Bill Henney and Yoder. Defending track champion Jason Zook held off the charges of Deron Henry to claim the xtreme stock feature event race. Henry started seventh but could only advance to second. Bob Bussey raced home third followed by Craig Dodson and Pete Leister.